As we needed a lot of wood for gaining very little tar I suggest that the pitch distilleries in Stone Age might have been not in the settlements but rather in the woods, where all raw material was in situ and no extra labour was needed to carry everything into the settlements except for the pitch at the end. Products of the distillation of, for example, birch bark or pine wood are tar and pitch. The terms have often been confused with one another, but according to modern terminology in recent publications (Hirzel 2007; Todtenhaupt et al. 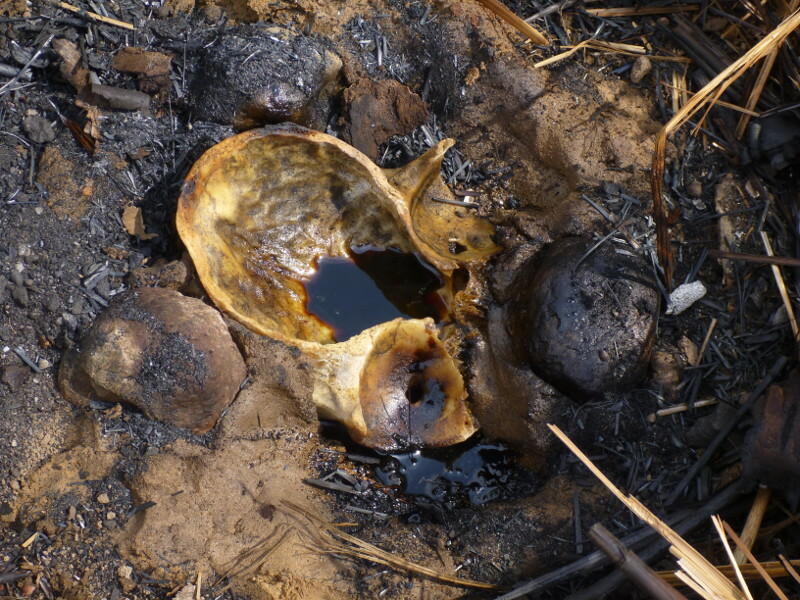 2008), tar is considered as a fluid, watery form, and pitch a more solid form of a very complex chemical composition. I did not find any other simple definition for this. 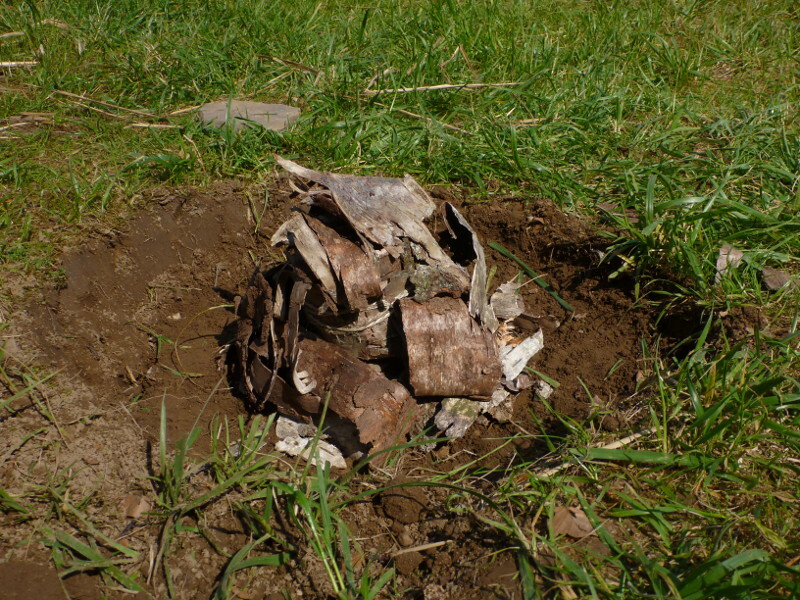 We undertook several experiments in producing birch bark tar / pitch, specifically concentrating on methods using no ceramics in order to reconstruct how tar /pitch might have been produced in pre-ceramic times. Two different methods of distillation were used, ‘open distillation’, where a pipe drains the gas / damp / tar mixture out during the firing process, and ‘closed distillation’ in which the distilled substances collect in a relatively cool vessel below the oven. The open distillation experiments were conducted by Werner Pfeifer. A hollowed out stick from elder (Sambucus nigra) lead from the bottom of the oven to the ground. The other opening ended above a vessel. 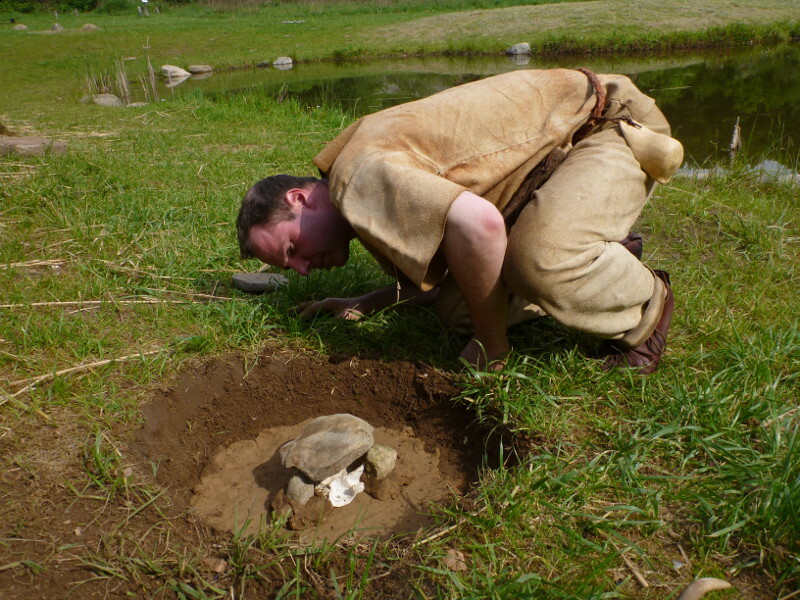 The ground of the ‘oven’, as well as the birch bark, were covered by a layer of a mixture of mud, clay and sand in which the fine grain part of clay was highly reduced. It should just hold the layer together, but should not crack while fired. The layer was only between 2 to 3 cm thick, in order to let the heat enter the interior easily. The layer around the bark was then smeared well with wet fingers to close all holes so that the bark was completely sealed. A ring of stones supports the structure. 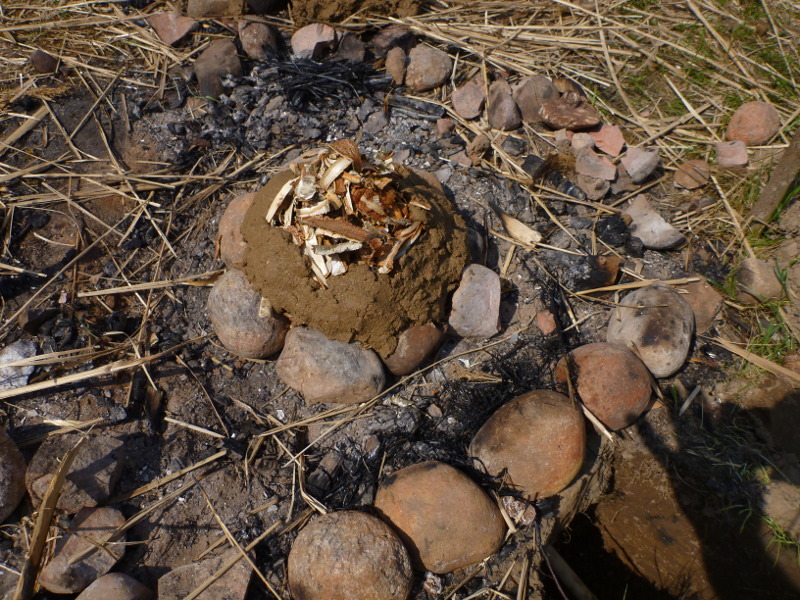 A thick pack of dry grass covered the oven to create a layer of ash around it to fill little cracks that might appear while firing. The oven was heated immediately for between two to three hours at the highest temperature possible. In general, there was ‘smoke’, which was a mixture of gas and damp, after about 10 minutes of firing throughout the process. After about 20 minutes from the beginning of firing we recognised a somewhat clear watery liquid (wood acid), mixed with occasional dark brown drops—the tar—dripping out of the pipe. After stopping firing the fire burnt down to ashes and let the oven cool down for half an hour. When breaking open the oven it was noted that, in general, all bark had turned into charcoal. 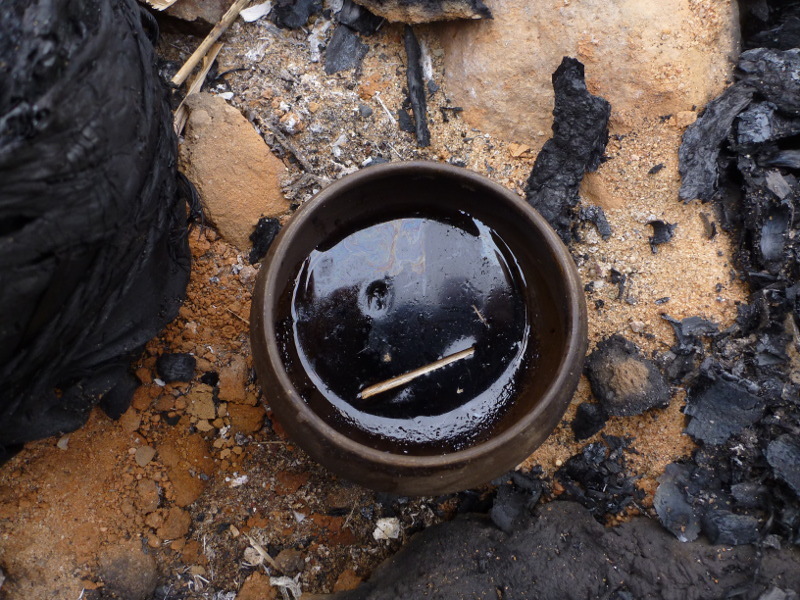 The vessel was then put close by or above a fire or hot embers so that the fluid evaporated and left a little bit of black, sticky pitch. The firing process in general consumed a full wheelbarrow load of wood for each experiment, sometimes a bit more when we had a good wind. With one experiment, the layer around the bark cracked slightly during firing and smoke came out of these cracks. 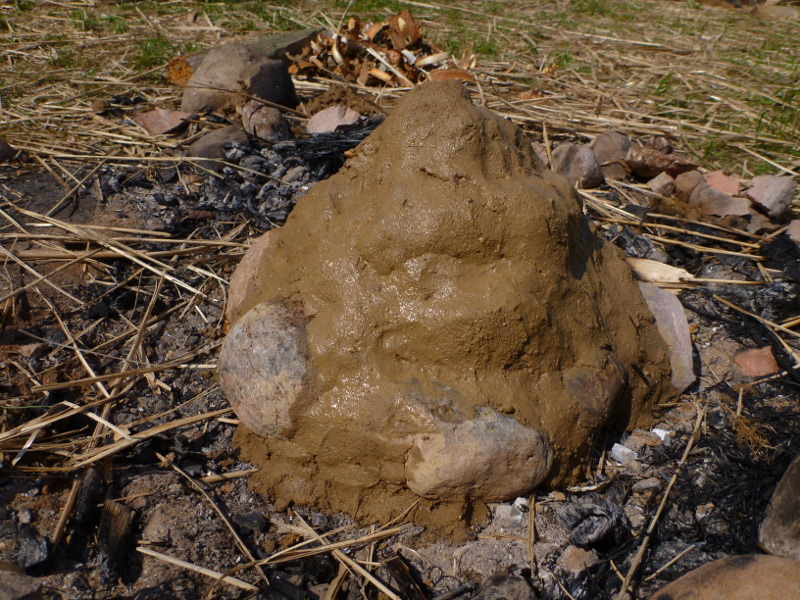 This layer contained a higher concentration of fine pottery clay than the other experiments. Filling the cracks with fine sand during firing did not close them properly; the cracks appeared at a late stage when most of the tar was in the vessel. This did not really seem to affect the distillation process. 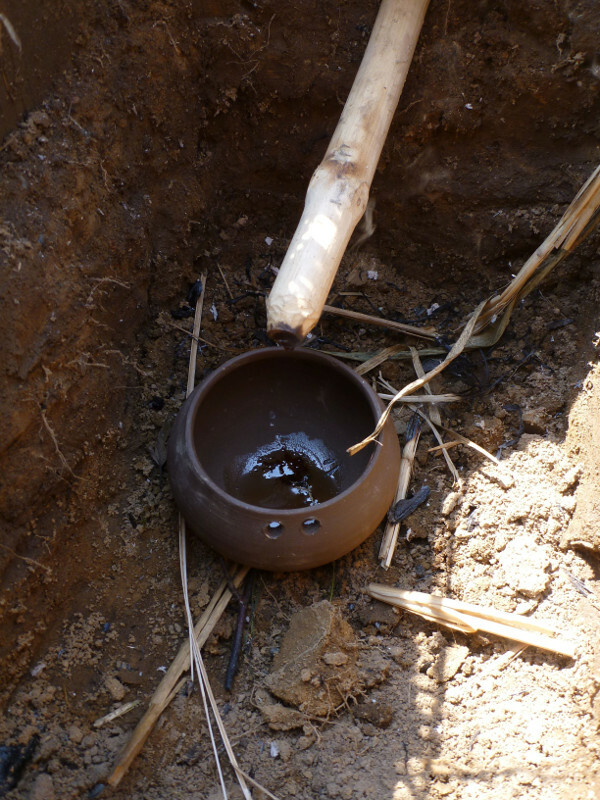 For reasons of comparison, one firing experiment was conducted with a raw (not burned) clay pot and one metal pot. The clay pot turned red while firing and after cooling down it was well burnt. When tapping it with a fingertip it gave a high tone, which indicates a well-done clay pot. This suggests high temperatures were reached during firing. Interestingly, the colour of the pot outside is reddish to light brownish, but inside is completely black indicating a burning process without oxygen. The sealing layer around the birch bark needs to consist of a high percentage of mud and sand and just a very small amount of fine clay. It must also be very thin (between 2 - 3 cm only) in order to let the heat enter the interior. 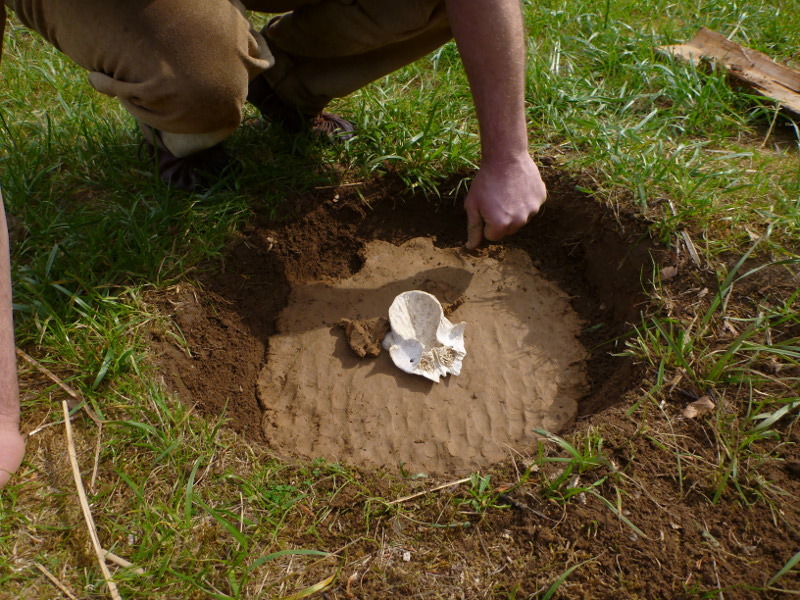 I had done an experiment a year earlier with a thick layer of about 8 - 10 cm of mud, which was far too thick. Although I had fired this one for several hours, the bark inside was not burnt at all! The remains of the clay/mud/sand layer after the firing process are quite soft and brittle when taken in the hand and squeezed a bit. This means that the remains of the oven are likely to have disappeared within a year or two. It will look just like any normal fireplace. Thus recognising a pitch distillation location in an archaeological context after thousands of years will be extremely difficult, if not impossible. There might be some remaining microscopic tar traces in the sand, but there needs to be some more investigation done on this subject. We did one experiment without any pipe or pot under the oven, but a 3 cm thick layer of sand on the bottom to see if the tar will be visible in the sand afterwards, but we could not find any traces of it at the end. As we needed a lot of wood for gaining very little tar I suggest that the pitch distilleries in Stone Age might have been not in the settlements but rather in the woods, where all raw material was in situ and no extra labour was needed to carry everything into the settlements except for the pitch at the end. Thus finding these places will also be very difficult nowadays. This might be a reason why no Stone Age pitch distilleries have ever been found. The result from the clay pot distillery experiment was that the pot was pitch black inside but did not smell at all of tar or pitch! I filled it with water after cooling down and there were no indications of oily or other substances on the water surface. The water tasted clear as well. This indicates that all tar had been removed during distillation, or some might have entered the clay itself, but left no visible traces. A colleague, Mrs Erika Drews in Albersdorf, had made a small clay pot distillery that yielded no tar or pitch in her experiment, but she claimed that after the experiment her clay pot was waterproof, which is normally not the case with this type of clay (pers. comm.). So it might be that the tar entered the clay during firing and sealed it. 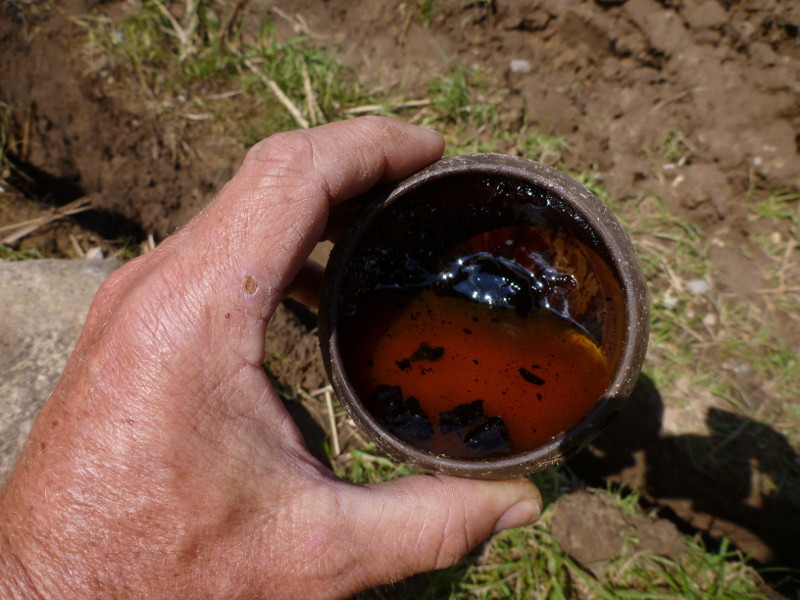 This means that archaeologists could look for traces of tar in the clay of late Stone Age vessels themselves especially when they are black inside. 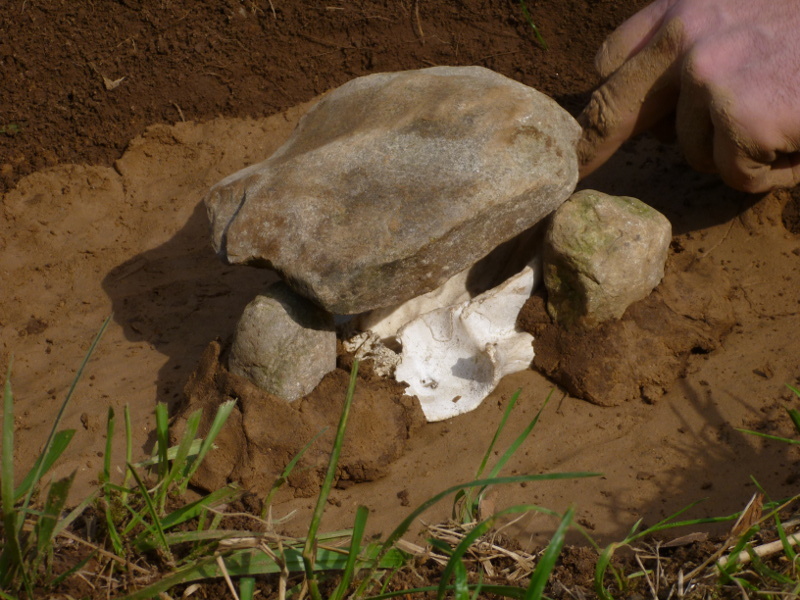 Marco dug a shallow pit in the ground, about 30 cm deep and about 60 cm in diameter. In the centre he dug a little groove for the vessel. The vessel was either a little clay pot, a can, or in one case a cut open part of a deer skull. The latter was used to see if a skull is useful to collect tar and even produce pitch with it, as clay pots and cans were most likely not invented yet during most of the hunter gatherer periods. 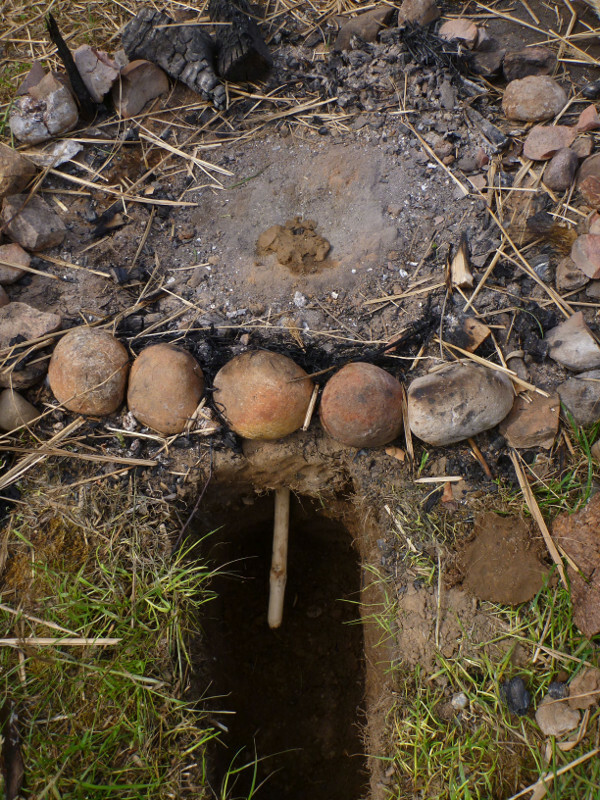 Then the bottom and the sides of the pit were smeared with wet clay to prevent tar disappearing into the ground. Small stones were set as little pillars around the vessel, about 3 cm high, to carry a small deck stone. The deepest point of the deck stone pointed to the centre of the vessel to let the tar drip into it. There was a space of about 3 - 4 cm between the stone pillars for the tar to find its way into the relative cooler room below the deck stone during the firing process. Birch bark was placed on top of the deck stone and a bit around it in a thick layer. To stabilise the bark, the space between the bark and the sides of the pit was filled with dry grass and little twigs. 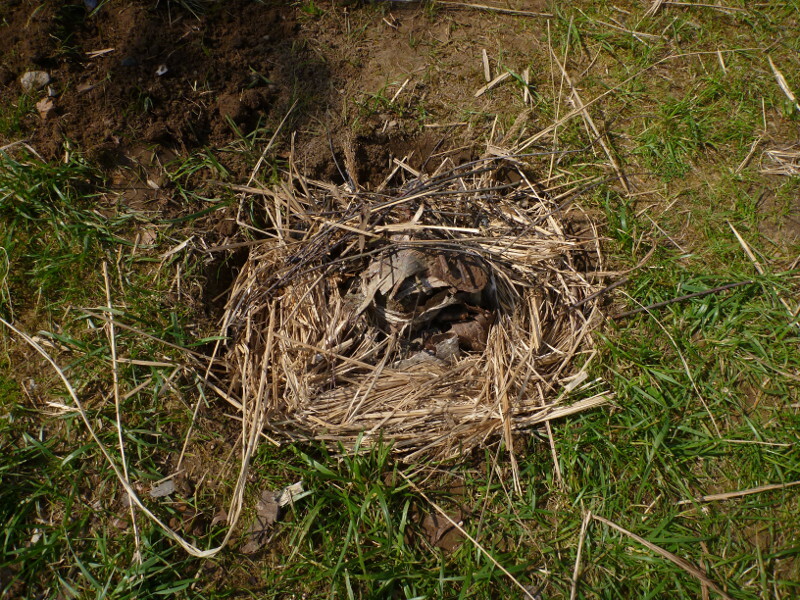 Then everything was covered with a layer of dry grass and twigs, filling the entire pit up to ground level. A thin layer of sand was put on top, then an approximately 2 cm thick layer of clay, mud and sand mixture to seal the whole pit completely. On top of this a big, hot fire, was made, which he fired for about 2 to 3 hours. 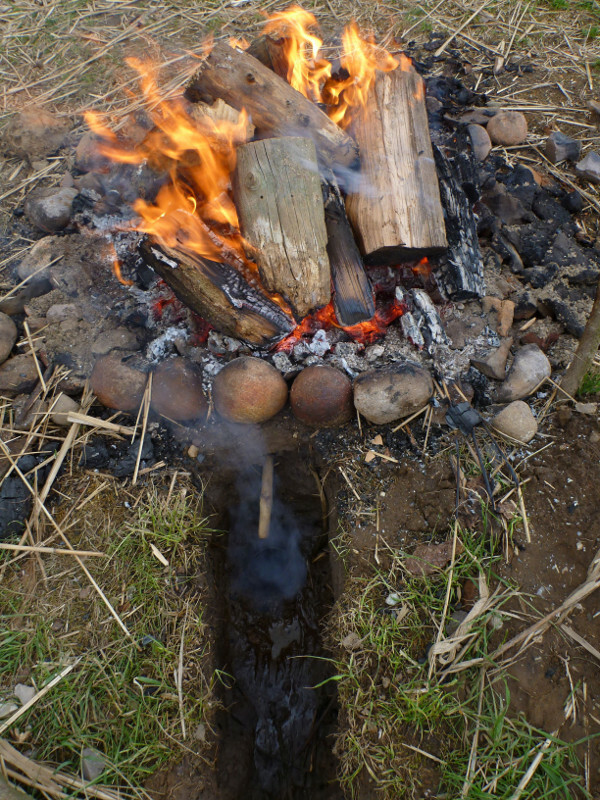 After letting the fire burn down, the pit was allowed to cool down for at least one hour, sometimes much more, to prevent the heat inside creating a fire when coming in contact with oxygen. 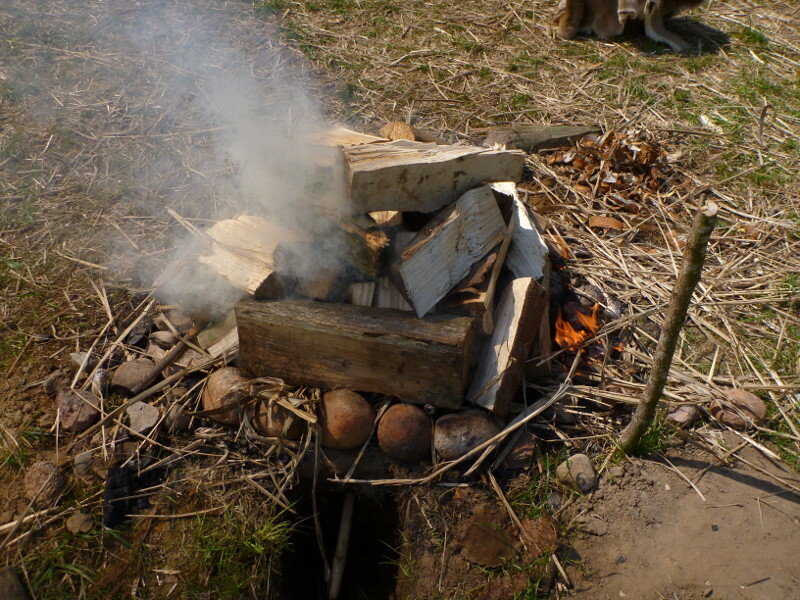 In general the birch bark turned into charcoal, especially in the upper layers. The vessel contained quite a lot of liquid and some tar, slightly more than in the ‘open distillery’ experiments. A lot of wood was needed for each experiment: about one to one and a half full loads of a wheelbarrow. In order to try to reduce the wood consumption, an approximately 60 cm deep pit was dug. The aim was to intensify the heat in the deeper pit and reduce the effect of the wind preventing the rapid burning of the wood. Instead, due to less oxygen in the deep pit, the fire did not burn hot enough to give enough heat for the distillation process. His one experiment with building a clay / sand / mud mound over the bark, similar to my technique, failed because his isolation layer was too thick. 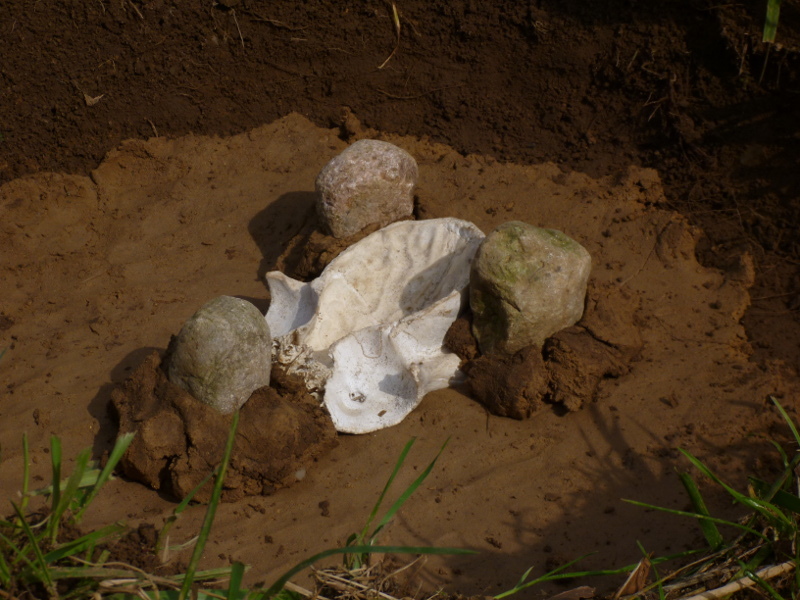 He had an about 3-4 cm thick layer of sand covering the bark plus a 3-4 cm thick layer of mud /clay. The temperature inside never became hot enough to produce tar. He just had a watery liquid in the vessel and the bark was not burned at all. He also made a controlling experiment with a metal pot in order to have a comparison with his experiments without pots. The results in gaining liquid and tar were similar in both methods. The ‘closed distillation’ method is very good for making tar. It might yield slightly more tar than the open method as evaporation is prevented in the closed system. It needs just as much wood as the open distillation method. I suggest thus that the Stone Age people would probably have done this in the woods, not in the settlements, to reduce labour. The fire needs a lot of oxygen, thus firing is best on ground level, not inside a deep pit. The isolation layer between the fire and the bark needs to be thin for the heat to enter the inner. Layers of up to 4 cm in total seem to work well. Thicker layers do not work. 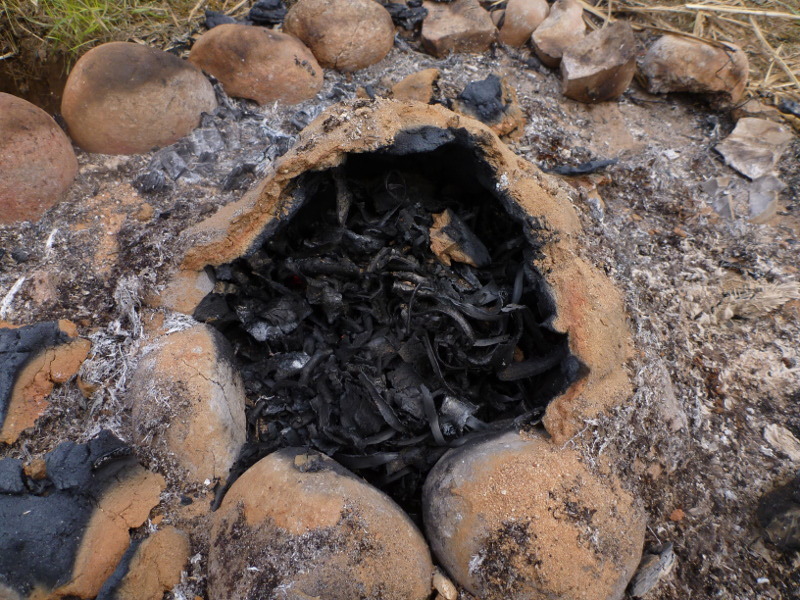 Remains of this distillation method will leave no more traces in the ground than a ‘normal’ cooking fire after several years, as no real fine clay is needed for any of this. 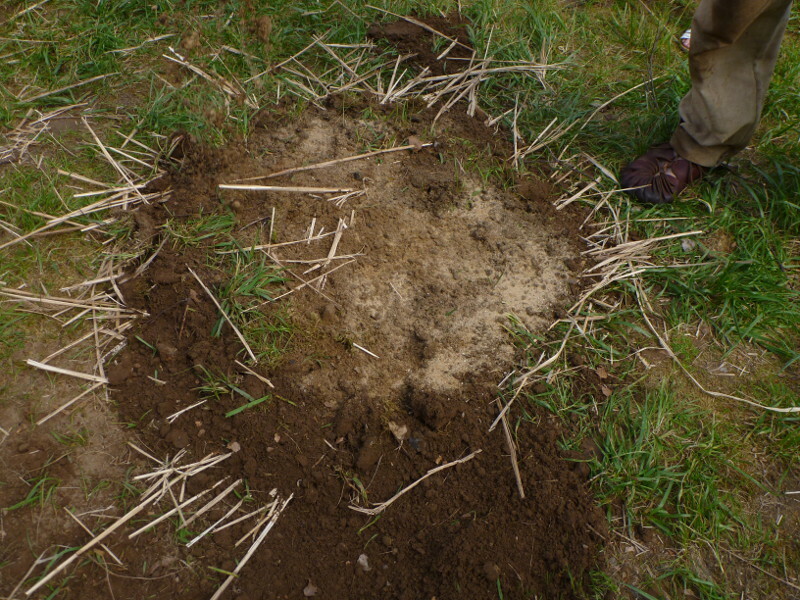 The sand / clay / mud mix used to cover the bottom and sides of the shallow pit is very brittle after firing and will disintegrate within a short time. 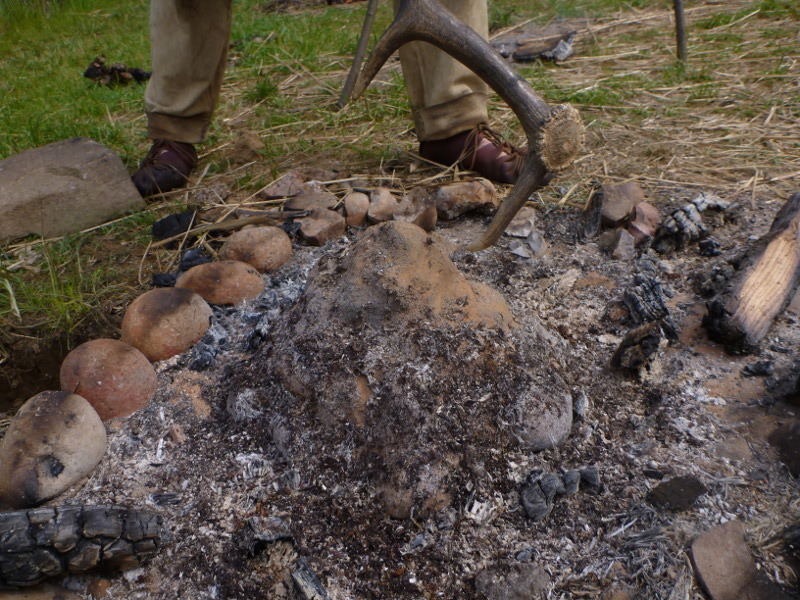 The deer skull used to collect the tar was placed on a grill made out of fresh willow so that it hung over a low fire/burning amber to heat it up very gently. The heat was high enough to let the liquids evaporate, leaving behind a fine pitch. So bone in form of a skull is good for this. Other vessels that still need to be tested via this method are birch bark containers, hooves, horn and wooden bowls (See Figure 17). To produce pine pitch pine wood was chopped into finger thin sticks and put into a metal container. This metal container was used to produce the tar. The former experiments illustrated how to make tar without pots, so we did not see the need to do the same with pine wood as well. The ‘open distilling’ method as described above was used. The tar was then heated it to become pitch. The result smells slightly different to the birch bark pitch, but looks the same. Future experiments will show if it can be used similarly to birch bark pitch. 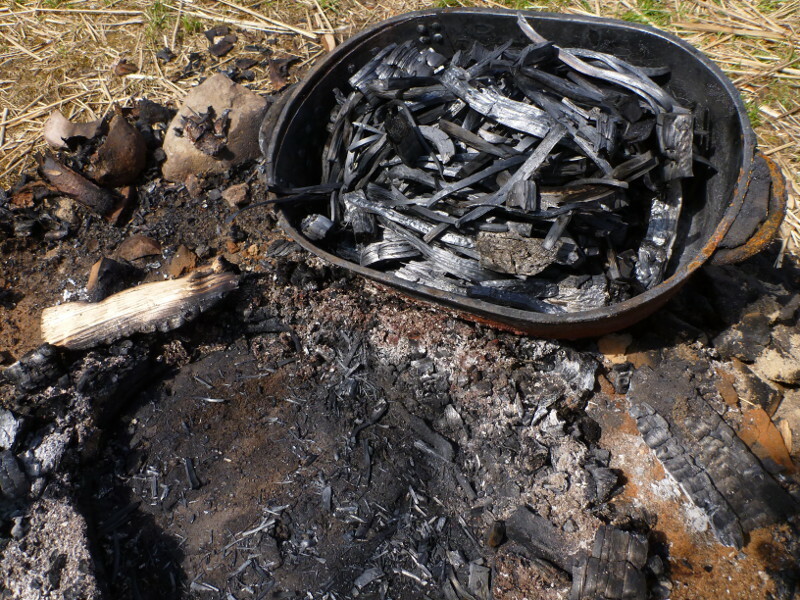 The wood turned into fine charcoal that I used to boil tar into pitch (See Figure 18, 19 and 20). Three parts of pine resin were mixed with one part of bee wax and heated until it melts together and becomes a yellowish creamy liquid. After cooling down it becomes a hard but not brittle glue. Earlier tests with this material on arrowheads, spear heads and knife shafts (all flint to wood, binding it with string and covering it with this glue) worked extremely well and is much easier to make. It also results in much higher quantities than tar and pitch in a much shorter time. Since the components—resin from conifers and bee wax—were available in most periods of Stone Age in Europe, the likelihood of making and using this glue is very high, although I have not heard of any archaeological findings yet. I received the idea and recipe from my friend Robert Berg (Thunderbird Atlatl, USA, pers. comm.). He uses this glue regularly on his Atlatl spears, hunting wild boar with it. Mix three parts pine resin, one part bee wax and one part charcoal (or wood ash from a fire place) together, heat up and stir it well until it is a black liquid and then use it as very hard glue. It seems that the charcoal binds the mixture even stronger than the latter method. 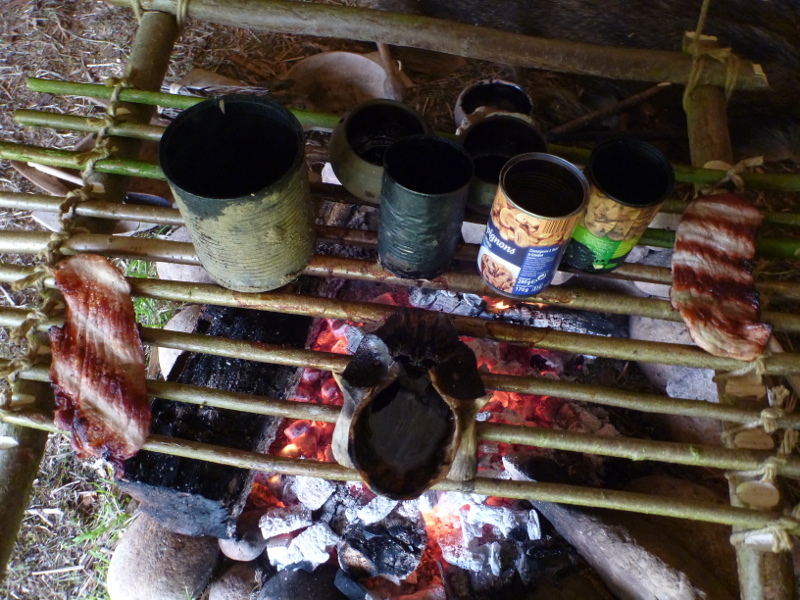 This recipe came from Ben McNut (bushcraft company in the UK, called Woodsmoke pers. comm. ), and I have used it on arrowheads (flint to wood). It works very well. As it is black and as strong and as hard birch bark pitch, it may be that some of the archaeological findings, claimed to be birch bark pitch, turn out to be this resin mix glue, especially as it is so much easier to make than any pitch. Two experiments were undertaken with raw animal hide. One was with rawhide from a pig. It did not turn into glue; this may be because it contained too much fat. The experiment with raw cowhide worked well. Pieces of rawhide were boiled in water until soft. When the water level became low, the heat was turned low and the water was allowed to boil very slowly. The hide turned into a slimy liquid—the glue. This glue seems to be very strong. The glue produced from the experiment was used in bow making, gluing layers of wood together or gluing raw hides on the bow back, et cetera. It is very strong and flexible, but loses its gluing effect when it becomes wet. Thus it is only partially useful in moist environments. There seems to be no archaeological record of this glue from the European Stone Age, but as the material was regularly available it might be possible that it was used. 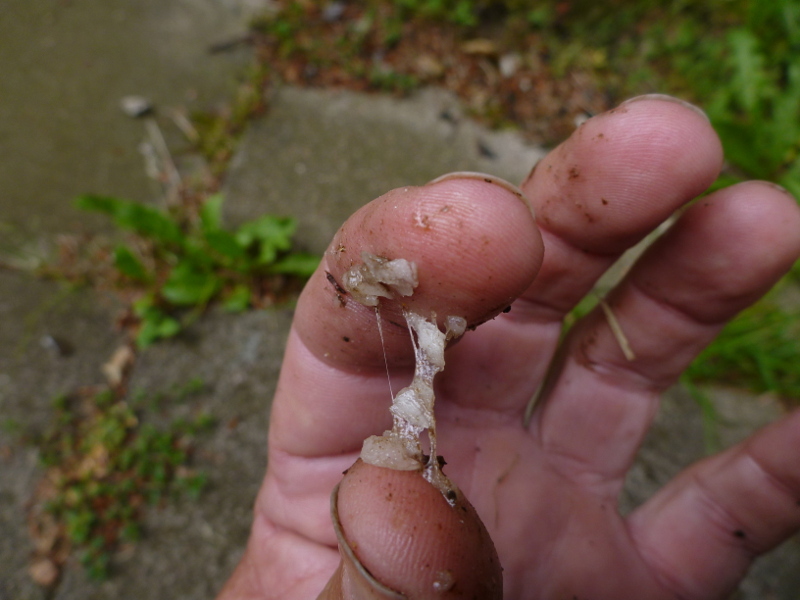 Similar glue types are fish hide glue and hoof and bone glue. Both need to be filtered to remove fat and minerals, watered and heated not higher than 60°C. It is best to heat them in separate ceramic containers swimming in hot water. Metal containers are said to interact in a negative way with the glue. Blue Bell glue The Blue Bell (Hyacinthoides non scripta) is a beautiful little plant, growing in parts of Western Europe. 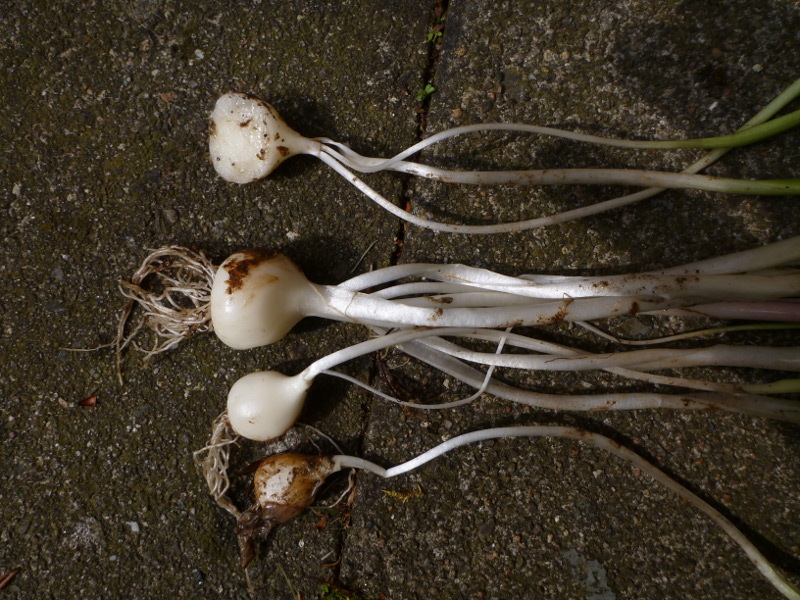 It has a little underground bulb that, if squeezed, produces a sticky liquid. I was told by Ben McNut (Woodsmoke, UK pers. comm.) that this liquid was used in former times in England for fletching feathers to arrows. You apply it directly onto the feather shaft and stick it onto the arrow shaft. I still need to do experiments with this (See Figure 21, 22 and 23). Wild cherry sap Dr Bruce Bradley (University Exeter, UK pers. comm.) told me that he had used the fresh sap of wild cherry wood as glue. The sap can be applied as it comes out of the wood and no processing is necessary. Pine resin sand glue In the Kazakhstan Region of Russia the people mix very fine sand with pine resin and charcoal. I have seen flint arrowheads glued onto shafts with this glue. The man Ajdar (pers. comm. ), who showed me these, did not know why they add the sand. I personally think the reason might be just to have more volume. Gluten glue Since the Neolithic farmers had access to starch. Pour hot water over wheat powder and mix it. It has a light sticky consistency that might have been used for some purposes as glue, where high strength is not necessary. I use starch regularly to fill little cracks in all kinds of pots and bowls. Honey is sticky too, but I doubt that this high valued food will have been misused as glue. Casein glue Mix casein (curd) with calcium hydroxide until it gains a sticky consistency. It is very strong and waterproof glue used on wood and leather. I still need to test it on projectile points. Fig 22. 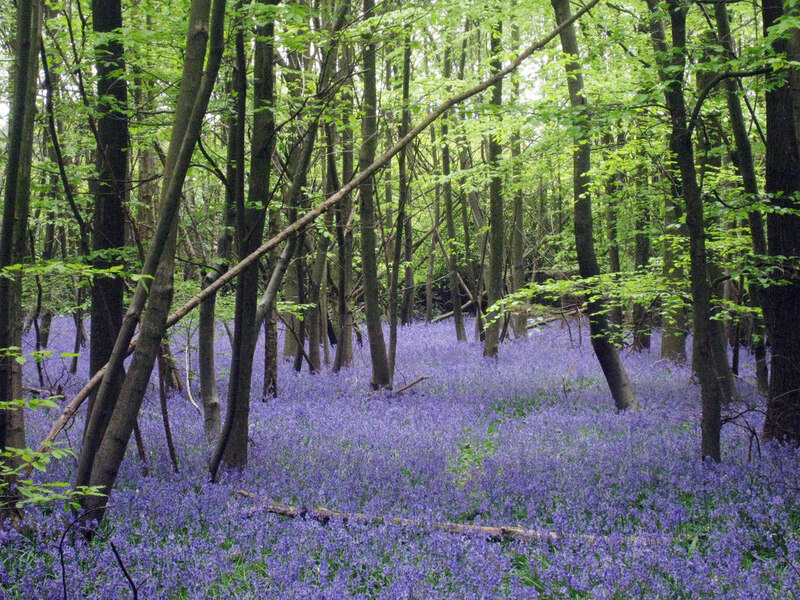 Bulbs of blue bell. Fig 23. Blue bell glue.